The third trade of the current incarnation of Daredevil wastes no time in introducing its core narrative. Upping the ante from the previous volume, not only does Spider-Man return, but the Punisher becomes the third component of the “Omega Effect” crossover. 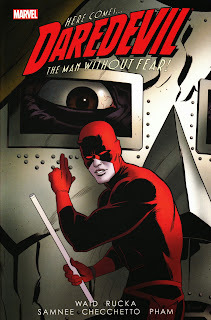 One of the central ideas of this run is that Daredevil is in possession of the Omega Drive, a database containing the financial information of numerous villainous groups. It’s built from a Fantastic Four costume and is thus made of unstable molecules, making the information on it both vast and very hard to destroy. Spider-Man wants Daredevil to hand it over to the Avengers for safe-keeping; the Punisher wants it to get ahead of his enemies for an easier slaughter. There are few comic book characters I dislike more than the Punisher. His very presence in the main Marvel Universe causes a conundrum: either the villains are made incompetent so that he can kill them, or the other heroes are made incompetent so that the Punisher looks good. When I read the Welcome Back, Frank trade, which many consider the ultimate Punisher story, I nearly threw it across the room when it came time for Frank Castle’s interactions with Daredevil. It was clear that Daredevil was being intentionally put down by Garth Ennis so that the Punisher could save the day. Many Punisher stories are also clouded by reams of angsty caption boxes about how much Frank hates the world. The plan, rendered beautifully across three issues by Marco Checchetto, naturally falls apart as Rachel hasn’t quite learned about the line between justice and vengeance. There’s a glorious scene in which Rachel claims that people who haven’t had a major loss in their life aren’t as driven as those who have lost a loved one. Daredevil’s response is to chew her out for insulting the thousands of police, soldiers, and firefighters who save lives without going through their own loss. It’s a pitch-perfect moment that makes me want to find out more about Cole-Alves’ character arc. Waid uses the JSA Cooldown Method -- a fun one-shot story bridging darker arcs [bless you for using this metaphor! -- ed.] -- to slow the pace down a bit in issue #12. Matt Murdock takes his new love interest, Assistant DA Kirsten McDuffie, to the fair and tells an “Untold Tale of Daredevil” about his college life with Foggy Nelson. There’s been an arc building for Foggy throughout the series; while it won’t pay off until after this trade, it does provide some great character-building for Foggy, Matt, and Kirsten. Foggy was a rich slob, and a professor who hated Foggy's privileged life claimed Foggy plagiarized a paper; it takes Matt’s brash judgment and Foggy’s newly-developed courage to come out on top. There’s even a possible cameo from a young Elektra (she’s jogging on page eleven of the issue). After this, Daredevil appears to lose the Omega Drive to the Black Spectre organization. I’m not going to ruin the twist because it’s very fun -- unexpected yet set up carefully if you look for the clues afterwards. This leads to Daredevil getting teleported to Latveria. Despite the cover (fun fact: the rivets on his mask spell “DOOM” in Braille), Doctor Doom sadly does not appear in this trade. Instead, Daredevil is charged with theft by the head of Latveria’s banks, Beltane (who seems to go to Virman Vundabar’s tailor) because of Daredevil's possession of the Drive. Next week, we go to Hell and back with Deadpool. Guest-starring drunken Tony Stark!